Holed up in a Grain Elevator overlooking a strategically vital square, you just watched the South Railway Station change hands 14 times in the past 6 hours. Will you survive the next onslaught? The Northern Factories: A ghastly place for a battle... heavy metal sheets creaking in the wind. Smart animals flee, leaving only rats to thrive in this burning hell! These battles use a brand new Combat deck, specially designed by Richard Borg for urban warfare. 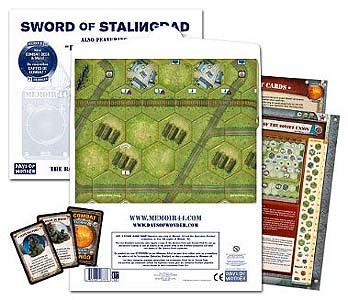 This Battle Map set also includes 2 Standard scenarios playable on a regular Memoir '44 board - Mamayev Kurgan and Pavlov, Hero of the Soviet Union, and Summary cards for the previously published Battle Maps and Mediterranean Theater. Also includes a revised Behind Enemy Lines Command card. This is not a stand-alone game! Requires one copy of Memoir '44 and the Operation Overlord expansion, or two full copies of Memoir '44. The two Standard scenarios also require a copy of the Eastern Front and Terrain Pack for set-up; and purists wishing to use all figures of the proper colour in the Overlord scenarios will need two copies of the Eastern Front expansion.